Ananya Chandrakar is a lovely little girl. Her father Bhagirathi, who lives in Dhanale village of Pandaria tehsil, did not even know that there was a hole in his daughter’s heart. Because of this, she would remain sick and her physical development had stopped. Bhagirathi explains that he did not have any idea at all, that Ananya was so sick. She used to study in Kunda school in 3rd standard. He has another daughter younger to Ananya. When the younger daughter also grew closer to the Ananya’s height, that is when he started to worry. Meanwhile, some doctors came to Ananya’s school to conduct medical checking-up on children. Among them were Dr. Rajnish Singh, a doctor of Chirayu Yojana. They made alternate checkups for all children. After Ananya's checkup, her father was told that she has a heart problem. After this, the doctor made a lot of efforts to treat it. The doctor performed some more checkups on Ananya and later when the reports came out, it was learnt that Ananya has a hole in her heart, but it can be cured after treatment. 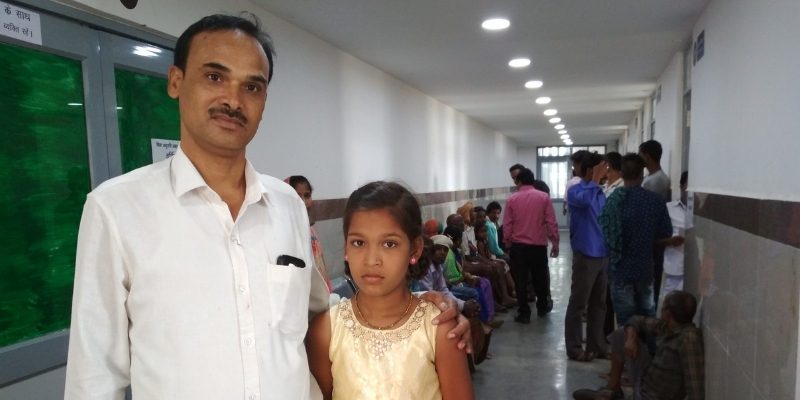 The Chirayu team sent online papers and soon she was successfully operated at Bilaspur Sims. Now Ananya has no problem whatsoever. If he had not known this at the right time, he could have not done anything, considering he lives with his family in rural areas. Rather Ananya could have faced more problems in the future. Khimesh has a similar story. Khimesh's father Sunil Kumar is from Moitampur Pundariya. His family has 9 members. Wife, grandparents, parents and two children. Sunil's second child's name is Khimesh. Khilmesh's feet were twisted since birth. By looking at it, it seemed that he would not be able to walk ever. Three months had passed since Khimesh’s birth, but Sunil was not able to gather any useful information regarding this situation of his son. He had a hard time worrying, how he would have his child treated. He was worried about his son’s future. A few days later, Dr. Raghuvir of Chirayu, came to the village. When he examined Khimesh, he advised Sunil to go to Bilaspur and he himself completed the rest of the proceedings and formalities. The child was sent to Bilaspur District Hospital for treatment. They put a plaster on his first leg, and then after a few days performed a small operation. After this, they again put a plaster. After this, Khimesh was made to wear a special pair of shoes. They will have to make him wear this pair of shoes for up to 3 years. Now he is happy that his son is able to walk. If this treatment was done in a private hospital then it would have cost him 60-70 thousand rupees. But with, the Chirayu Yojana of the Chhattisgarh government he got the treatment for free and he is fit to walk now. The kids are thrilled again. The treatment of lakhs of children with similar conditions in Chhattisgarh is conducted under the Chirayu Yojana. Under the Rashtriya Bal Swasthya Karyakram, necessary medical facilities are being provided for the health checkups of lakhs of children. In the Kabirdham district alone, 1,70,000 children have been provided with free treatment. The objective of this program is to screen out children in the age group of 0 to 18 years in four phases. Post that, there is a provision of treating 35 types of diseases in children through Chirayu. The children of Chhattisgarh are sent to more than 100 higher institutions in the country for the treatment of the diseases detected during diagnosis.